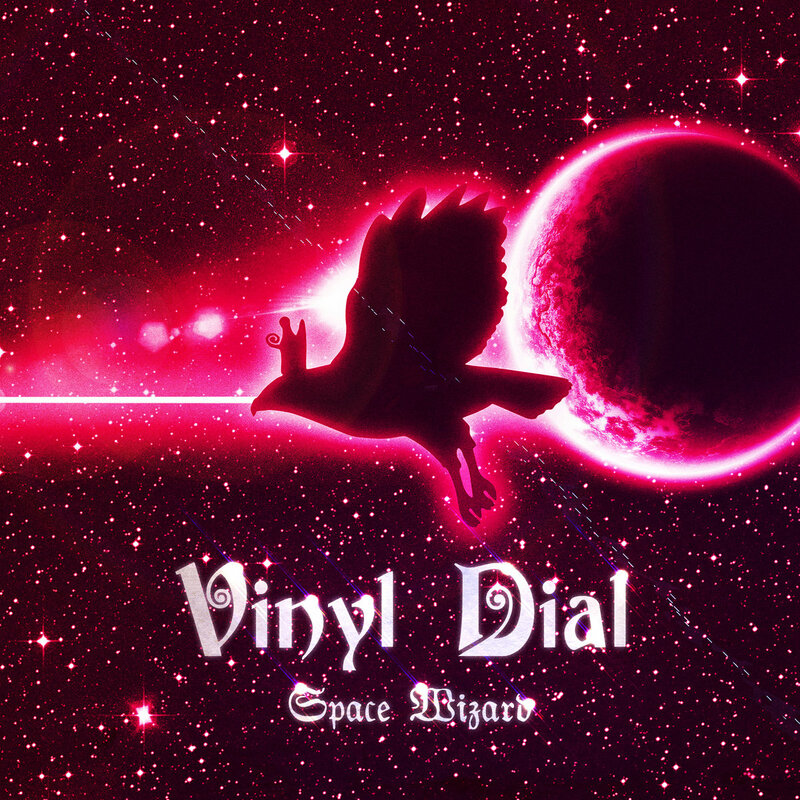 Vinyl Dial is an independent musician from the UK and co-owner of the Flamingo Vapor record label. He is also the pioneering producer extraordinaire behind the progwave sub-genre who’s new album Space Wizard marks the 137th release on Flamingo Vapor (according to the catalog number). Although the label is called Flamingo Vapor, vaporwave is not the only type of music that is released on there, for example they have also released some lo-fi hip-hop beat tapes recently, such as the album seikatsu // sounds by seikatsu. The album Space Wizard, is itself is a unique genre-defying experience, expanding upon previous iterations of progwave fusion to deliver a more overtly progressive rock oriented album with various electronic influences. It is, to be honest quite an ambitious project in term of scope, vision and execution which, in terms of format, follows the prog rock tradition. The album is divided into two distinct sides a, cheeky reference to the format of seminal 1970s prog rock, where albums where structured around the constraints to the the vinyl LP. The first side contains a handful of relatively short tracks followed the a second side which is taken up with a single prog rock epic. On Space Wizard this epic is called ‘Bad Trip’ and is just over 23 minutes long, marking a near identical length to ‘Supper’s Ready’ by Genesis. The album starts with the sounds of birds tweeting accompanied by a piano melody. Shortly after, the drums and guitars kick propelling the opener, ‘Into the Oversky’ into motion. This track sets the proper mood for the rest of the album with melodies that are very pleasant and warm sounding. For a more rock oriented listener this album offers up plenty of guitar riffs to keep the you interested throughout. Track no.2 ‘Aeronausea’ features some math rock and Djent vibes, it’s not quite as aggressive sounding as Djent, but the guitar riffs featured here are as intricate as what can be found in those genres. This track is entirely instrumental, unlike the opener where one vocoded line sung by Vinyl Dial himself was present. In ‘Spectral Universe’ the vocoder is once again featured, as Vinyl Dial sings about the album’s hero traversing the Spectral Universe and slipping away. This track has more of a traditional prog rock vibe and already packs a punch right from the start, this high-energy is kept throughout the song. The two tracks leading up to the epic are a bit shorter than the previous tracks, as is common for a lot of prog rock albums (Pink Floyd – Echoes and Genesis – Foxtrot come to mind). ‘Solar Sands’ is a fun 3-min track featuring the leitmotif chord progression that is present throughout most of the album. ‘Anunnaki’ is the only other instrumental track on here and serves as a bit of a more laid-back song to prepare you for the ‘Bad Trip’ that’s about to start. Bad Trip is divided into six parts, it starts with the Space Wizard Overture, a grand instrumental intro to what’s about to happen in the next 23 minutes. The 2nd movement, ‘Adrift on the Blackwater Sea’ continues the steady build-up towards the next section. In Eight Sun Setting the first climax of the song comes to fruition, but shortly afterwards the build-up continues in ‘Star Cycle’, keeping the high-energy intact. Passage to Niburi features the signature vocoded voice of Vinyl Dial once again and is the last lyrical section of the album. Aphelion Aves is a groovy closing section with a surprisingly upbeat melody towards the end, in contrast with the somewhat gloomy lyrics on the album overall. It’s clear that this album is an impressive feat, clocking in at almost 51 minutes it explores lots of different themes and music styles, all while being highly energetic and with top-notch sound engineering and mastering. Space Wizard is a highly engaging listen and fits right in with the prog rock classics of past decades. You can hear that Vinyl Dial put a lot of time into crafting this album, paying great attention to detail and the result is definitely worth listening to. Not everyone might appreciate the fact that there is not really a breather track on here, but for me personally I can overlook it since you can hear a musician who is absolutely having a blast.